Japan has developed what is arguably the most sophisticated and the most democratic broadcasting system in the world. The Great Kanto Earthquake of 1st September 1923, with its devastation and confusion drove home in its appalling way the importance of being able to broadcast immediate information to the public. The same year, the Ministry of Communications promptly established an administrative system to regulate broadcasting. In less than a decade over one million people were registered listeners. Under the post war Constitution of 1946 freedom of "speech and all other forms of expression" was guaranteed, and the subsequent Broadcast Law instituted a dual system of broadcasting with the public service Nippon Hoso Kyokai (NHK) on the one hand, and commercial and private broadcasting organizations on the other. In 1978 there were ninety-one television broadcasting organizations and fifty-one radio broadcasting organizations. 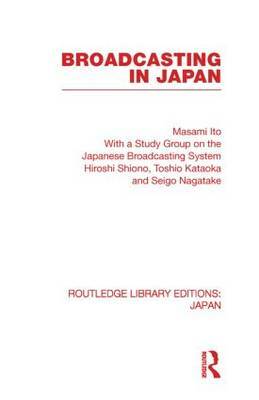 In this informative study, Professor Ito and his team comprehensively describe the staggering growth of broadcasting in Japan from the dawn or radio and television to satellite communication and through to the multiplex broadcasting of the future.